See how to transform $5 bar stools from the thrift store into tall nightstands. 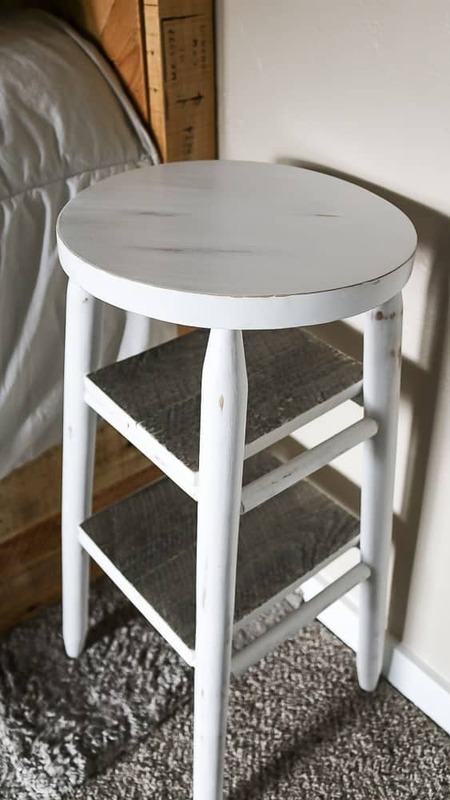 Upcyling a bar stool into a narrow bedside table is so easy to create with a little chalk paint and wood for shelving. I received product samples from General Finishes for review purposes for this narrow bedside table post. The opinions are completely my own based on my experience. Also, this post contains affiliate links, but nothing that I wouldn’t wholeheartedly recommend anyway! Read my full disclosure here. We didn’t have a nightstand next to our bed for WAYYY too long…like years long. Our master bedroom was small and I could never find a nightstand that was narrow enough to fit. When I saw these bar stools at the thrift store for $5, I thought they would be perfect for a little thrift store upcycle project! Turns out that these bar stools were the perfect height for tall nightstands and they don’t take up much room at all in our small bedroom. 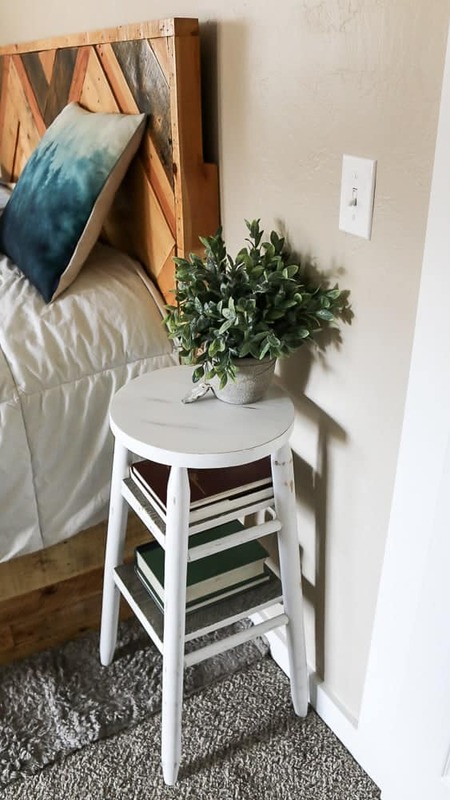 I love the extra storage space we were able to add to the bottom of the bar stool to create shelving on the narrow bedside table…perfect place for some books and to hold your cell phone. I got this vintage medicine cabinet at a thrift store! Check out how much farmhouse charm it adds to our bathroom. 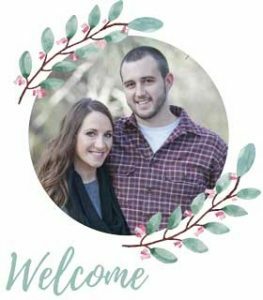 You love farmhouse decor? Find out where to buy farmhouse decor on a budget. 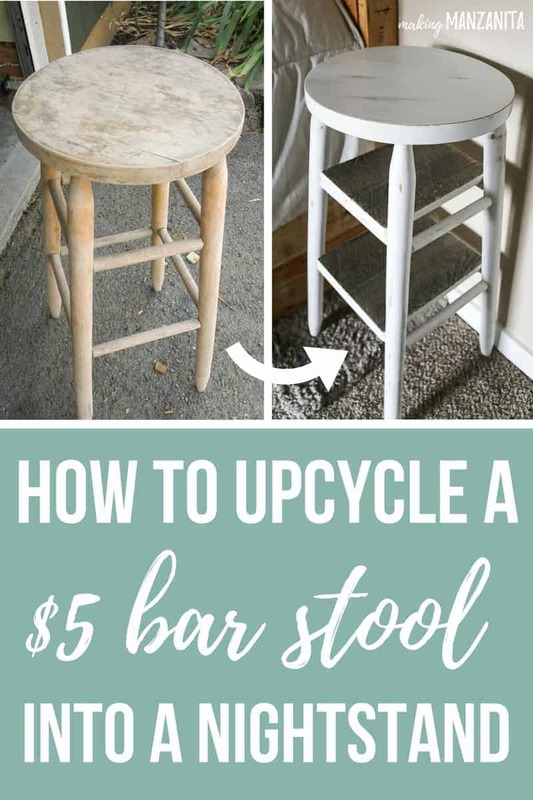 Are you ready to see how to upcycle a bar stool into a narrow bedside table?! Step 1. Sand bar stools. Using 220 grit sandpaper, lightly sand the bar stools. You want to remove the finish and give the paint a rough surface to adhere to. After you’re done sanding, be sure to wipe down the bar stools with tack cloth or slightly damp rag to get all the sanding dust off. Step 2. Prime bar stools (optional). I used 2 coats of the General Finishes stain blocker white primer. 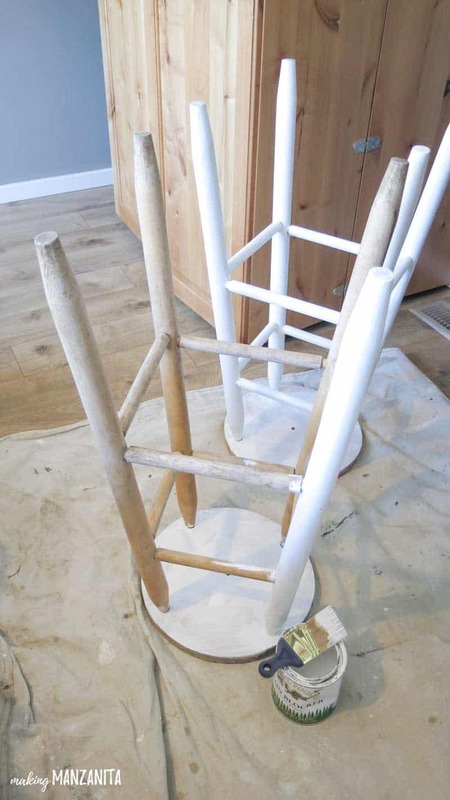 This helps prepare the bar stools to be painted and provides great coverage so you end up using less chalk paint because you’ve already blocked the color of the wood. However, I DID find it a bit harder to distress the bar stools since I used the primer. Since this wasn’t a furniture piece that’s going to get a ton of use (it’s just going to sit next to our bed), I probably could have done without the primer to make the distressing in the end a little easier. Step 3. 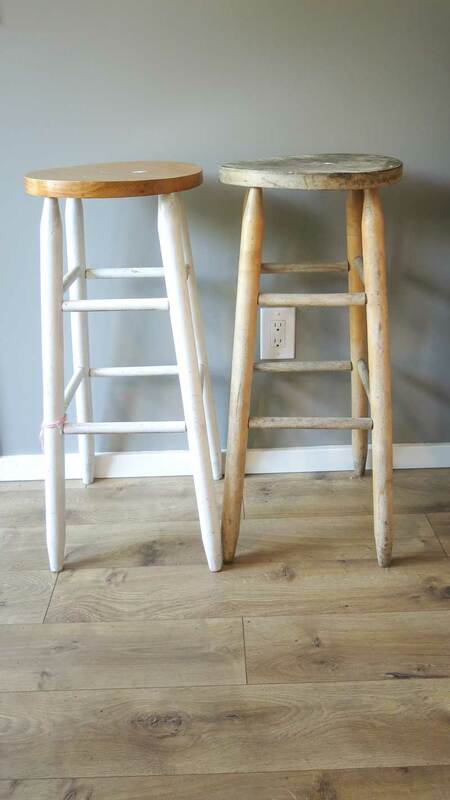 Chalk paint bar stools. Apply chalk paint to the bar stools. I did 2 coats with this paint brush to get the look I was going for. Step 4. Distress painted bar stools. 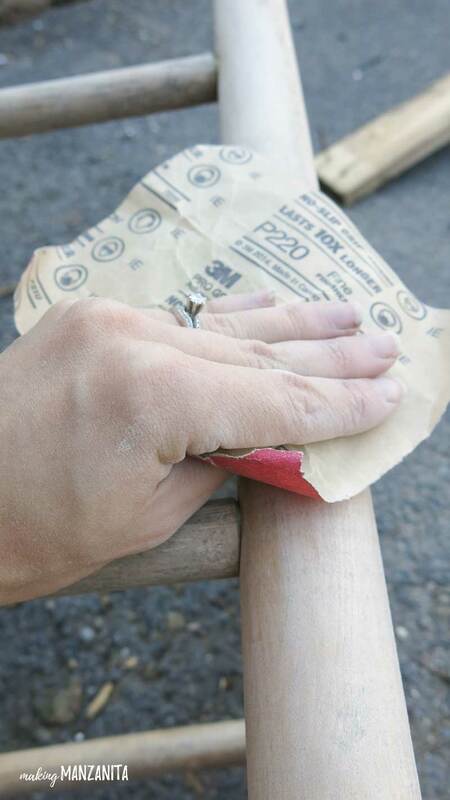 Using some more 220 grit sandpaper, sand the bar stools down to your desired distressed look. As I mentioned in the video below (at 14:00), I had a harder time distressing these since I used the primer. It just took more elbow grease than I’m normally used to. 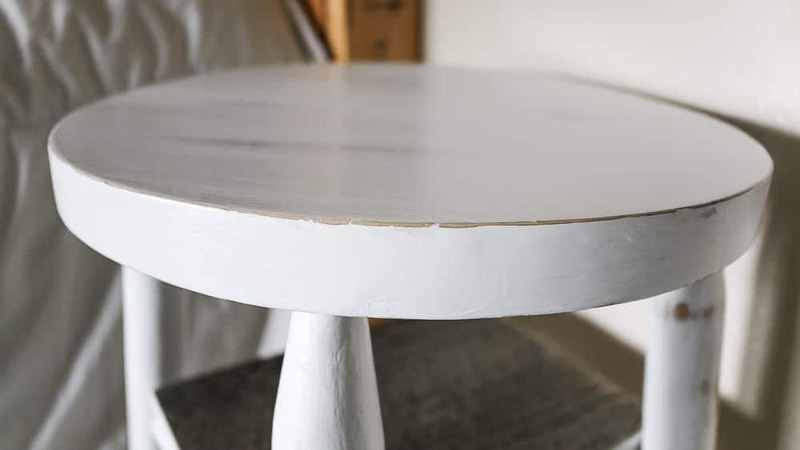 To make things a little easier if you’re having trouble distressing quickly, you could use a coarser grit sandpaper to start with or even try this trick with applying some Vaseline before painting to certain spots so the paint doesn’t adhere. Be sure to use a tack clock after you’re done distressing to get all the sanding dust. You could also use a slightly damp rag for this. Step 5. Seal bar stools. Using the top coat sealer, brush on one coat with a foam brush in smooth even coats. Don’t brush back and forth a lot. Just one coat brushed on and leave it so it doesn’t start to gum up. If you need more than 1 coat, you can come back afterward and add more. General Finishes recommends sanding with a fine grit sandpaper between coats too. I just did one coat of the sealer. Step 6. Cut ghost wood down to size. Each bar still will be different, so measure your bar stool between the rungs (foot rests) to see how big you need to the ghost wood. Alternatively, you could use pallet wood or another kind of wood too! I just love the way this ghost wood shiplap looks. Step 7. Paint edges of ghost wood with chalk paint. I wanted the edges of the ghost wood shelves to match the rest of the bar stool night stand, so I opted to paint them white using the same chalk paint. Block off the top of the ghost wood with painter’s tape to protect it before painting and then apply 2 coats of chalk paint. Step 8. Sand edges of ghost wood. Using 220 grit sandpaper, give the edges a little bit of sanding to make it batch the distressed look of the rest of the narrow bedside table. Step 9. Set ghost wood into upcycled bar stools. Just set the ghost wood onto the rungs of the upcycled barstools and VOILA…they are all the sudden now narrow bedside tables! This is where this bar stool upcycle project really starts coming together! I’m happy to report that the narrow bedside tables are the PERFECT height to function as tall nightstands next to our bed. I love the shelves to stacking books that I’m reading. It’s got a perfect little spot for my cell phone to rest all night long too! 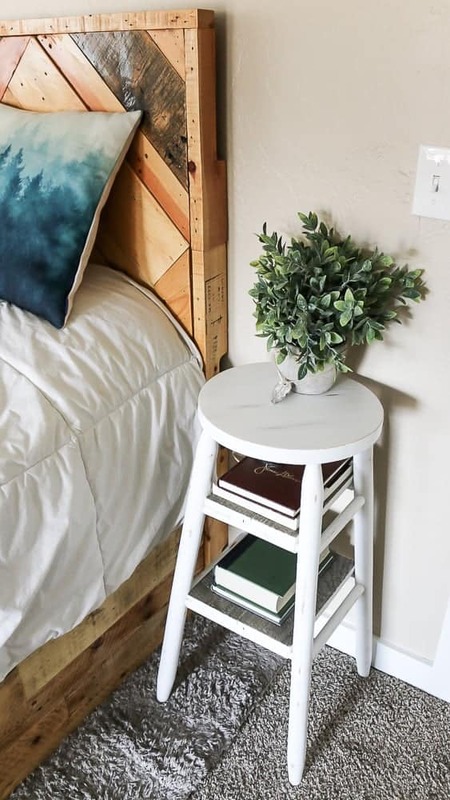 I love the way the nightstand comes together in our master bedroom once it was styled with some books and a faux plant (similar here). Even if you don’t need a narrow bedside table, you could also use these as a narrow side table in your living room next to your couch. Transforming these thrift store bar stools into tall nightstands was really simple. All it took was a little bit of painting and some wood shelves cut down to size! If you’re new to the furniture painting world, this is a great little project to get your feet wet. I only paid $5 per bar stool at the thrift store, so it’s not a big investment at all. 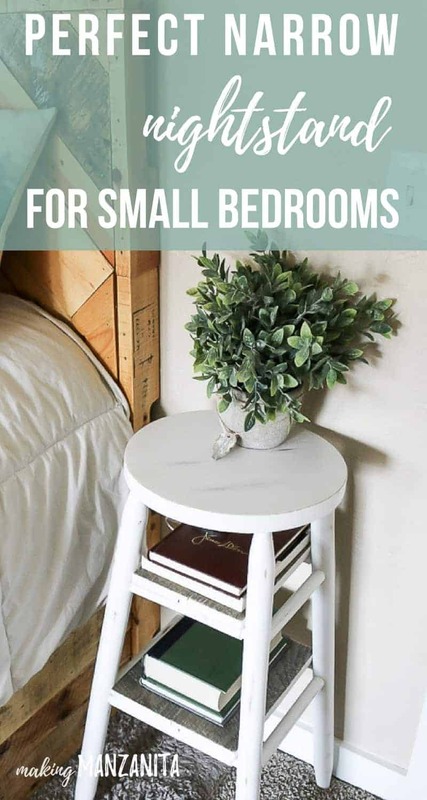 What are you wondering about these narrow nightstands? ?…here’s some frequently asked questions during the live video tutorial (video is below if you want to watch). I answer this question at 6:00 in the video below! You’re using chalk paint, I thought you didn’t have to prime or sand with chalk paint?? I answer this question at 8:30 in the video below! Before you take off, be sure to check out what my fellow upcyclers created below! We have the same issue in our master bedroom of not really having enough space for night stands. This is a great solution! Great idea. I’ve been on the nightstand hunt and this is a good alternative. Love how you added “shelves”. 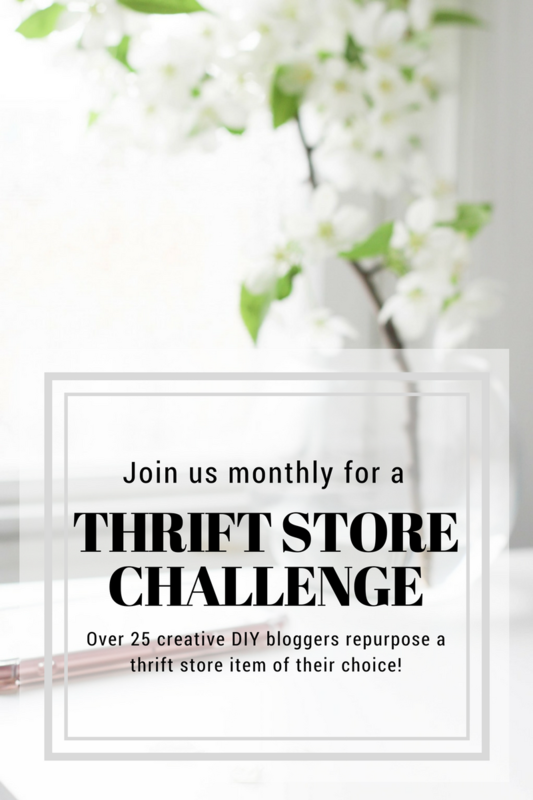 Visiting from Thrift Store Challenge. I just love bar stools as side tables. It’s such a great farmhouse look. Yours turned out great. Very clever and they turned out really pretty. Eclectic decor is always fun! 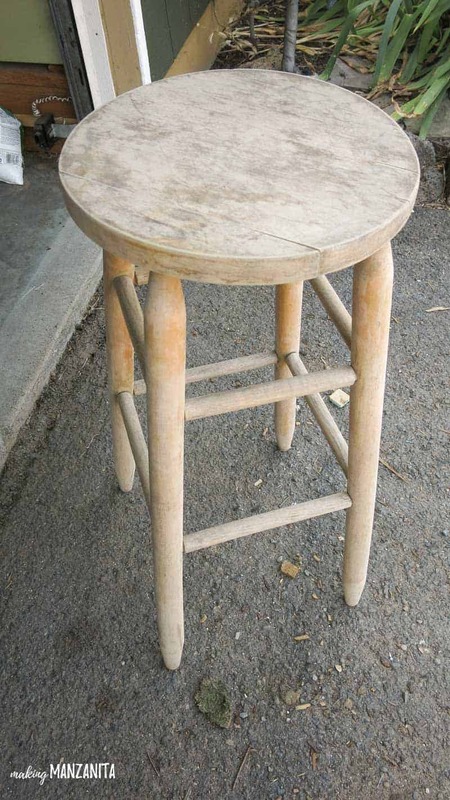 I have a $5 bar stool sitting in my craft room right now waiting on a makeover! Those turned out so cute!! What a great idea. These bar stools look great! I love the shelves on them for storage. Very creative idea. This is a very cool project! Love the added shelves! What a fabulous idea!!! And can I just say how gorgeous your bed is? Did you make that yourself, too? Yes my awesome hubby made it out of pallets ! This is a fantastic upcycle. I like how you added the extra storage by creating the shelves on the rungs. In the original picture one of your bar stools has a curved seat, I have one just like it. How do you get the curve out so it is flat? Cheryl, there’s two different bar stools. One has a curved seat and one doesn’t 🙂 I didn’t carve it out. 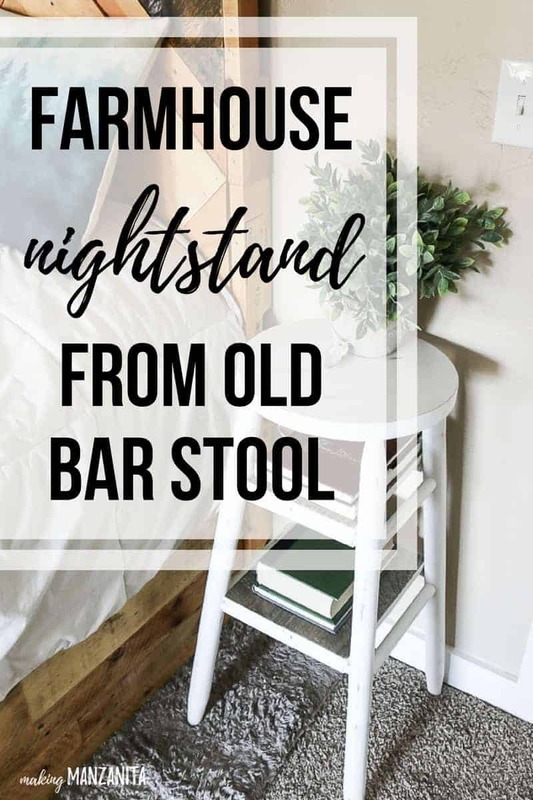 I’m so glad that someone else is using a bar stool for a narrow area nightstand. My husband thought I was crazy. I slipped two large plastic bowls between the legs to throw my glasses, earrings, paperback book and cell phone into before I go to sleep. Can’t wait til hubby comes home so I can show him this and say, HaHa. You could also paint the plastic bowls to match the stool. Just rough them a bit with sandpaper before painting to give them some extra tooth to hold the paint. Maybe consider using a bond primer first as well. Cute idea. What a great idea! I have a question. Did you design and build your bed and headboard? From the little I can see it’s beautiful, and it’s exactly what I want for my bedroom, so please tell me if you did do the headboard and bed. So…if I’m understanding this, you didn’t attach the shelves to the rungs, just set them there? Very cute idea, btw, just wondering about the specifics to make my own. Yeah I just set the shelves directly on the rungs, it works fine. The only time they’ve come off is when my toddler decided it was fun to take everything off the shelves and play with the wood pieces. You could use some heavy twine to hold the boards in place. Glue the first end of twine to the board, then wrap around the rung and glue second end to the board. You could use two pieces of twine on each side of the board. Then when your ready to repurpose the stools again down the road, the twine can just be cut off, board can then be removed. Definitely, Nina! Thanks for the tips!